Recently Nintendo hosted demo events for Super Mario Odyssey, and we went along to capture video of three new stages. Digital Foundry was also there to play the same stages, and of course the team has done its thing in breaking down the technicalities of what they saw. They assess a few things, including the pleasing news that the resolution when docked has gone from 720p to 900p, adding a bit more pop to TV play. In portable mode it's 720p in gameplay, but interestingly there are some relatively subtle graphical adjustments to ensure solid performance with the handheld. Pleasingly, it's looking like a solid 60fps throughout, which is great to see; the only exception is the Snapshot mode, which boosts image quality as you create your snap. It's pleasing, as always, to see Nintendo focus on 60fps performance in gameplay. That's the way Mario platformers should be, right? I will always take a buttery frame rate over a higher resolution. I would rather have this than 1080p at 30 frames. Also, I need this game yesterday. Huh ? Yesterday what ? How ? @Anti-Matter It's a figure of speech. By that, I mean I want this game so badly that today wouldn't be soon enough. @thesilverbrick couldn't agree more. Framerate directly affects gameplay, resolution doesn't. I'm so happy to see this. Looks gorgeous and yes Mario games should always be 60 fps. These games coming out keep showing more and more of what the Switch can do. I think we're really going to see some beautiful games over the next few years. On 27 October 2017, the "King" of Nintendo Switch games will be released. @thesilverbrick except when it's NBA 2K18 or DOOM, amirite?! Totally cool with this. Man, I want this game. Still a month to go. All games (except turned based ones, I guess) should aim for 60fps. I wish companies would stop trying to push 4k so hard and worry about making 1080 more stable. The game keeps getting better and better! 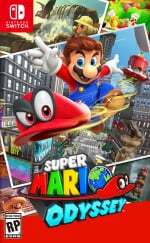 Mario Odyssey will probably get my GotY vote. Sorry BotW. 900p 60fps? I’m sold... well, I was already but now I’m happier! Why can't it do 1080p AND 60fps? The main takeout for me from the video is how Mario's conk wiggles when he walks! It could, but visual quality would have to be sacrificed. Switch doesn't have an infinite well of resources to draw pretty pictures from, so frames, resolution and quality have to be balanced. Even on the most powerful PC in the world, you'd be able to get better image quality at 900p than at 1080p, because the resources you would have spent on resolution you can now spend on visual detail. There's ALWAYS a balance, no matter how much power you have. @SLIGEACH_EIRE Because the Switch is a joke, hardware wise. Indeed. After Mario Galaxy, all 3D Marios should be 60fps. Whatever necessary drop in resolution to achieve this is fine by me. And Odyssey's looking awesome! @Menchi187 That's the answer, as a console, it's a beast as a handheld. @SLIGEACH_EIRE why can't it do 4K and 60FPS and give me a back rub at the same time? Come on! The game looks ace. 900/1080p will make a negligible difference when you're actually playing the damn thing having an amazing time! A month and whole six days at university to go. Already set the alarm clock on my phone to October 27, 0:00. Gotta finish Mario + Rabbids before then. @beazlen1 I'll absolutely love the game regardless. Just pointing out the limitations of the hardware. I'd rather the game was 900p and 60FPS with amazing quality / increased poly count / better textures / lighting / effects etc etc than 1080p / 60FPS and a quality that suffers because of it. People forget it's not just FPS vs resolution. It's FPS vs res vs all the other stuff the GPU and CPU are doing. @SLIGEACH_EIRE so is this the game you'll get a Switch for? People talking about hardware limitations when the Xbox and ps4 struggle with 1080p60. Maybe it's because I don't have a Switch but! I don't know what to make of this game. It just looks like Mario is going across a barren landscape with no challenge to a checkpoint flag. The landscape is very sparse, probably to keep the game at 60fps and keeping memory down. The comment about it feeling like Galaxy 3 is not what I wanted to hear either. I was hoping more for a Sunshine 2. It's terrific that it's 60fps. And people are happy about it (rightfully so, 60 is better than 30) but that doesn't mean people only play games at 60 and it doesnt mean a game is magically unplayable at 30. It's kind of a genius move to run "snapshot mode" at 30fps and crank up the visual settings, it means that all the pictures shared by the press and on social media will make the game look just a teensy bit better than it does in practice (which usually goes the other way, as anybody will tell you that Mario Kart, for example, looks better in person than in stills or on Youtube because the high framerate makes everything look so smooth and vibrant in person). @timson72 This is an ignorant comment, it has nothing to do with the resolution or FPS, is not the hardware fault but the software. If the developer try to to do more with the system than it actually can then of course it won't work. But for example Doom, is 1080p 60fps on PS4 (dynamic res) while is just 720p 30fps on Switch with lower assets. Is just about Knowing what the system is capable of an adapting the game to it, and Nintendo does this better than anyone. If they Did this game for Ps4 for example it will be 1080p 60 for sure, and PERFECT 60fps, and much better looking, so the problem is not the hardware, but developers trying to do more than the system can do for the sake of raw pretty graphics over artistic quality. In the case of a Mario game, yeah, prioritise FPS. It's funny that, while Switch is clearly less powerful than PS4 or XB1, 60FPS is still a rarity on any Console. Think I'm moving over to PC/Switch in 2019. @SLIGEACH_EIRE You don't have to "point out the limitations of the hardware." We all know the specs, and us grown ups have moved on and are now enjoying the Switch for its amazing games. "Just pointing out the limitations of the hardware." Yeah thanks. Nobody would have known otherwise. Depends who's making it. Insomniac settled for 1080/30 with Ratchet and Clank, then chose to up resolution for Pro with no change to frame rate. 60 FPS is exactly what I wanted. @TeslaChippie The weird thing is how people keep acting like this is even a debate. When was the last time Nintendo had the most powerful console hardware? Maybe N64 vs PS1? Until DreamCast came out, that is. Going back to the release of the Gamecube, Nintendo has been very up front that they are not interested in participating in the cpu/gfx benchmarks race and just trying to focus on making great games. Nobody is pretending otherwise. I'd bet in the not-so-distant future we will get a "New Nintendo Switch" with slightly better hardware... Or hopefully it will come in the form of a "Super Dock" that improves performance when docked and would be much cheaper than a whole new console. @gatorboi352 I'm not quite sure what you're getting at, but as a rule I prefer a higher frame rate over a higher resolution. Sometimes, due to poor optimization, 60 frames isn't possible at any resolution, which is a shame. @holygeez03 I don't my friend. The wait for the WiiU's successor was long enough and the games we've had so far on Switch have been nothing short of awesome. @SLIGEACH_EIRE You are aware that the majority of AAA titles on PS4 and XBox One don't run at 1080p and 60 frames, right? But seriously, it's nice that they're more concerned with hitting 60fps. On the PC I regularly sacrifice resolution/visual effects so I can play 60fps, and I don't regret that loss. So WHAT if just only 900p 60 fps ?? Will you DIE if you see that specs ?! No! I don't want to see any video of SMO! I was actually tempted by this... I don't really know why, but discussing about technical stuff in videogames can actually be pretty addicting. There was a time when we discussed about 8-16-32-64 bits. Know people are so aware (or think they are) about technical data that they become obsessed by even small details. And I can totally understand this attraction! But in the end I know that graphics, if they work right (no big glitches and a balanced presentation), are just important in the first 15 minutes, if a game is is really good, and this totally will be, then it draws you in and you don't even think about resolution and framerate. And Mario is this. I remember playing Super Mario Land on the game boy (I'm even replaying that one on the VC) and being totally drawn in that incredible world. I learned years later that those enemies are turtles and not ants . Anyways, I just read this and came to the comments, 'cause I don't want to spoil this game to me. Seeing how a fair few games really do feature 1080p/60fps on Switch, the limitation is as much the game Nintendo chose to make as it is the hardware. There is likely to be games on XboxOneX that don't hit 1080p/60fps either, and there's a limit to when you can say that this is because of hardware. This dude is really a celebrity here huh everyone answer back to him. @DanElectrode yes. And static vs moving makes a big difference in the perceived image quality. I recently picked up a Nintendo new 2DS XL and one thing that stuns me is as how good the graphics are. Of course if you take a screenshot and blow it up on a computer monitor it's pretty crappy but in practice it's amazing. This is going to be a long wait. Good thing my switch already has a backlog....sigh. HYPE!!! I want this game right now! Finally, a game worthy of buying a Switch for. @SLIGEACH_EIRE Because it's an open world game. Duh. 900p is plenty. @electrolite77 Because you don't grasp a simple concept, Upping the Resolution only taxes the GPU, upping the framerate also taxes the CPU that needs to prepare help the frames in 16.6ms instead of 33.33ms (for 30 fps), the Pro has a much Better GPU, but the cpu is only 30% faster. If the Cpu was already maxed out that 30% won't take the framerate to 60 no matter what you do. Why do you think Switch games don't change Framerate according if its or not docked? because the CPU stays the same 1020Mhz, no matter if is docked or not. What's your problem? I was just pointing out that some developers prioritise resolution over frame rate even on non-realistic games. Wind your neck in. otherwise known as those who ruin the poetry of a game with stupid comments and technical analysis. This game can't come soon enough. Between this and Breath of the Wild Nintendo's gonna be having one heck of a good year! Throw in a Pokemon game too, which even despite some lackluster hype, always sells well and the bigshots at Nintendo will be in for some pleasing numbers by the end of the fiscal year. @TeslaChippie I always thought the original XBox (which came out a few days before the GameCube) had more powerful hardware. I remember Nintendo talking about it at E3 when they were talking about why they decided to do a more cartoony Zelda for Wind Waker versus trying to go HAM on high-def graphics. @timson72 Heck, I know of far more people use the PS4 Pro to run things at 1080p/60 rather than 4k/30. It's always going to be frame rate or resolution. @AlbertXi It depends. Fire Emblem Warriors has 1080p30 and 720p60 modes. If the CPU isn't the bottleneck, then the frame rate can be doubled if the resolution is halved. @DanElectrode That's a common misconception, mostly due to the fact that the Xbox's CPU and GPU were clocked higher than the GameCube's (and thus has a higher floating-point calculation rate). However, comparing the two consoles on clocks alone only tells half the picture; the GameCube was capable of all sorts of visual tricks (including higher resolution bump and specular maps as seen in Rogue Squadron III: Rebel Strike and depth of field in games like Metroid Prime) that the Xbox was either worse at, or couldn't do at all. What the Xbox was GREAT at was processor intensive tasks like AI or rendering particle systems and fur at high frame rates (as seen in the Conker remake). HOWEVER, in practicality, the GameCube just didn't see a lot of games that used its capabilities to the fullest (with a few exceptions), while the Xbox got technical masterpieces like Halo 2. In the end, I would say Xbox had the better looking games, even if it wasn't the most capable games machine. No one knows Nintendo harware bertter than Nintendo lol. @CrazedCavalier I'll choose frame rate everytime. I'm perfectly fine with 720p as a minimum so long as ia game achieves 60fps. While 30fps is tolerable, it affects my opinion of the game a lot more than lower than 1080p resolutions. Playing Xenoverse 2 is an important example of the difference; one on one battles at full 60fps make other modes look like slow motion and painful in comparison. @electrolite77 LOL The Problem is you made an ignorant comment, saying that for Pro they prioritized Resolution, if you had left that part out of the comment, then yes you would have been right, some prioritized looks over FPS, and that is Ok depending on the game. However saying that for Pro they just upped the resolution because you think they could have changed the FPS instead shows complete ignorance on the subject (being ignorant of something is not a disrespect I bet there of tons of things you know I don't) because as I pointed out you don't know if the limitation was already on the CPU so no matter how much GPU power you add the framerate won't double if the game is CPU dependent. Stop being a whining boy just because someone corrected you, instead appreciate the time it takes to explain something so you may learn something new. @SLIGEACH_EIRE Have you bought a SWITCH yet then? Please hurry up and get one!